Can anybody in D1 Central or West stop the versatile Sean Burke and St. John's (Shrewsbury)? With the regular season now out of the way, it is on to the postseason and, just like any other year, this season’s basketball state tournament brings with it a bevy of questions. Here are five different storylines to follow in this year's tournament. 1. For Mansfield, is the fourth time the charm? In each of the past three seasons, Mansfield has entered the tournament with state championship hopes, only for their season to come to a crashing halt at the hands of Catholic Memorial. Three years ago the Hornets fell to the Knights in triple overtime, before losing a seven-point lead in the south sectional finals in 2015. Mansfield then saw a tie game early in the fourth quickly slip away last season in the sectional semi-finals. Now, with Mansfield sitting as the number one seed in Division 1 South, all eyes will be on the Hornets to see if they can overcome their past troubles with the Knights. Catholic Memorial staggered to begin the year, but finished by winning seven straight games to land in the top five in Division 1 South. If the Hornets hope to ultimately make it to the TD Garden, they will undoubtedly have to get past the team that has knocked them out the last three years. Maybe the Hornets simply cannot do it. Maybe Catholic Memorial is to them what the Florida Gators were to Peyton Manning in college, but the Hornets’ veterans in Max Boen, Sam Goldberg, and Tyler Boulter are all sure to know what they are up against should they meet in the Knights in March. 2. Does anyone give Cambridge a run for its money? At face value this may seem like a question to scoff at- Cambridge tore through their regular season schedule, finishing 19-0 and winning 16 of those games by 20 points or more. Yet to consider the Falcons unbeatable is foolish. In the final regular season game of the season, Central Catholic showed a potential formula for beating the Falcons, slowing the pace down, showing physicality down low, and turning the game into a rock fight. If Rick Nault is able to get a second shot at the Falcons in a potential sectional final matchup, and make the necessary adjustments from the two teams' first meeting, there is certainly a reason to believe that the Raiders would have a puncher’s chance. 3. Is this year that someone not named Putnam or St. John’s (Shrewsbury) represents Central/Western Mass in Division 1? 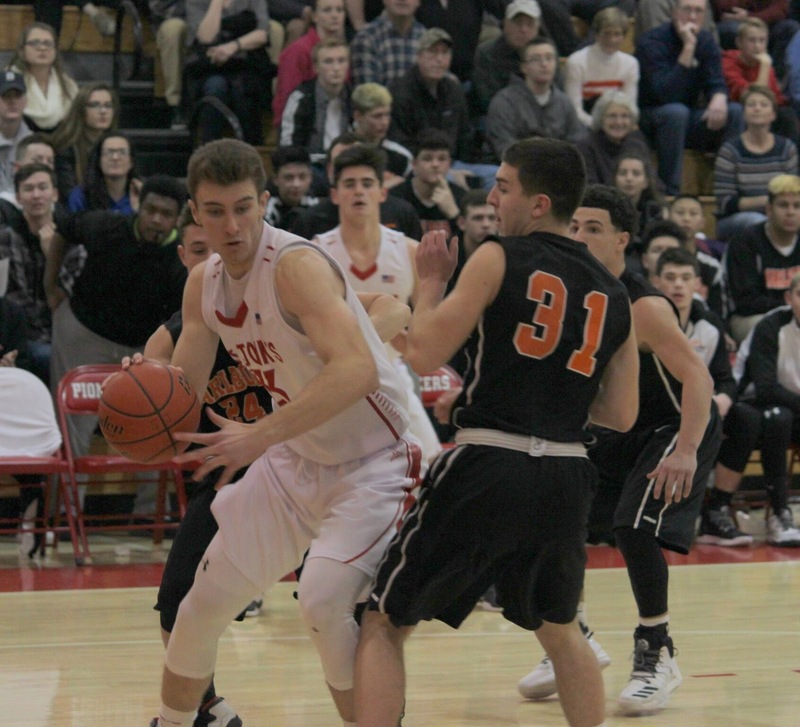 There has been a lock on Division 1 Basketball west of 495 for the past five seasons, with Putnam participating in three state championships and the Pioneers playing in the other two. This year though, there appears to be some true competition. Out in Division 1 West, Springfield Central had quite the regular season, going 16-2 while knocking off Putnam twice. In Division 1 Central, meanwhile, Franklin has shown they are a favorite to make it to the state championship, splitting the season series with Mansfield, coming up one point shy of a road victory at Catholic Memorial, and finishing 14-2 in the Hockomock League. So, while parity out of Central and Western Massachusetts has been minimal the last half-decade, this year appears to be headed for a different outcome. 4. Who is the favorite in Division 2 North? Across all eight sections, there is not one more loaded with talent than Division 2 North. Arlington, behind senior star guard Colin McNamara, enters the tournament undefeated. Reigning Division 2 Champion New Mission lost two of their last three regular season games, but doubting Cory McCarthy is always unwise, and Charles and Charlie Mitchell present a matchup nightmare for any opponent. Brighton, for their part, has the ability to put on an offense clinic, averaging over 80 points a game this regular season while showcasing their worth in the Comcast Tournament against Division 1 powers BC High and Needham. One team in the middle of the pack to watch is Belmont. The Marauders have a bevy guards, led by Daniel Yarmedian, that can shoot the three. Combine that with big man Paul Ramsey and Belmont will be a very tough out in Division 2 North. 5. Who will emerge as this tournament's breakout star? It seems that during every state tournament, a player who may have gone unnoticed during the regular season makes his presence known in a big way. Last year Newton North’s Mike Davis helped lift the Tigers to the Sectional Final, scoring more than 20 points in each of Newton’s first three tournament games. Back in 2015 it was Catholic Memorial’s Matt Hanna, as the then-junior point guard scored seven straight points to begin the fourth quarter in the Knights' state semi-final showdown with Cambridge. BC High center Jordan Minor seems ripe to finally burst onto the scene after averaging 10 points and 9 rebounds this regular season. Another player to look out for is Rivaldo Soares, O’Bryant’s apparent star-in-the-making sophomore guard. Above everyone else though is Arlington’s Bensley Joseph. The freshman put his full abilities on display in the Comcast Tournament, scoring 18 points in Spy Ponders 65-63 win over Malden Catholic in the championship game. If Arlington hopes to live up to their undefeated record in the tournament, Joseph is a major key.